Hello everyone! For our educational topic this month we thought we would discuss how to safely bring your pets to the vet! We often have people ask when they book an appointment how to bring in their animal. We are starting with birds and will also include information on small mammals, reptiles and aquatic creatures (amphibians and fish). So let’s get started with our feathered friends! 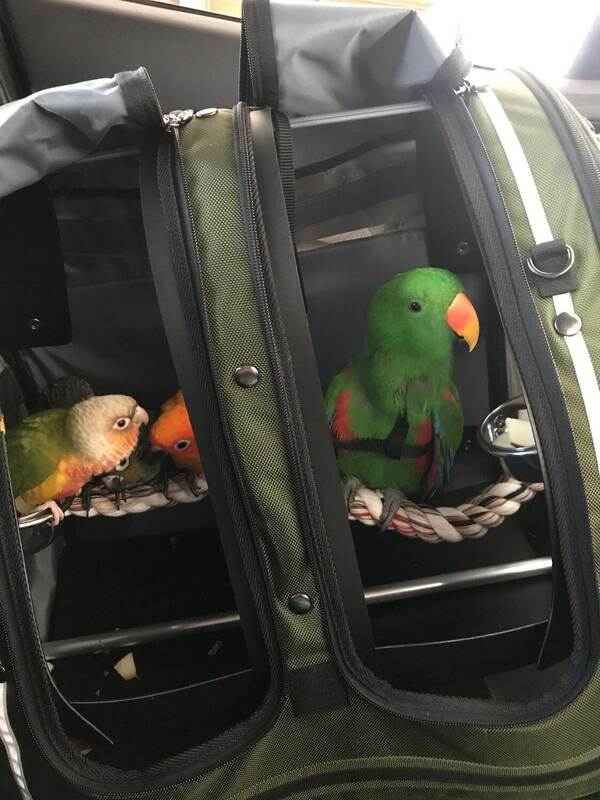 How do you transport your bird to the vet? There’s no one correct answer to this question, we’ve seen all manner of cages, carriers and make shift transportation here at BBEVS! What we do NOT recommend is bringing you bird on your shoulder, or in a box they can easily escape from. Our waiting room has automatic doors, and even birds who have their wings trimmed can escape in the blink of an eye! If you have time to plan in advance then a purpose built carrier or small cage is best. There are many different options available at pet shops, veterinary clinics and online. 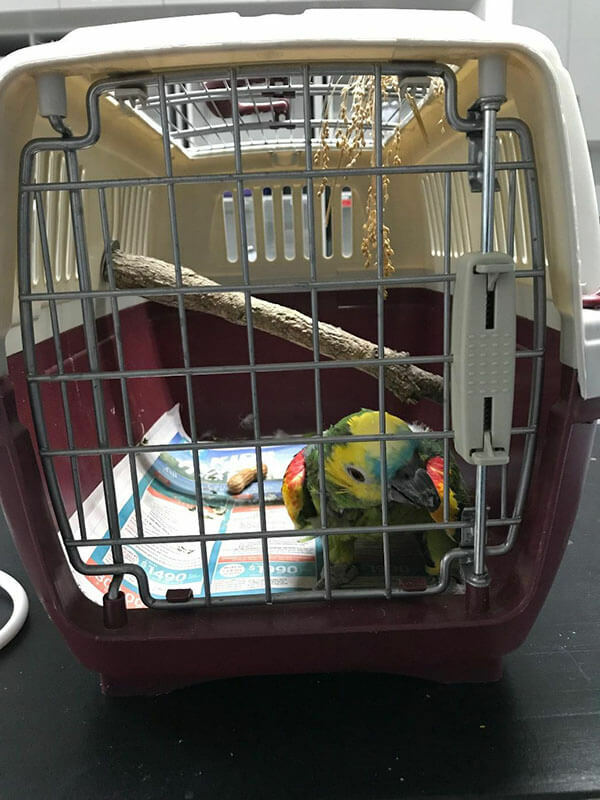 Generally smaller works better as it is easily transported into the car and the clinic, and it’s generally easier for the vet to perform a quick capture of your bird to check them over. 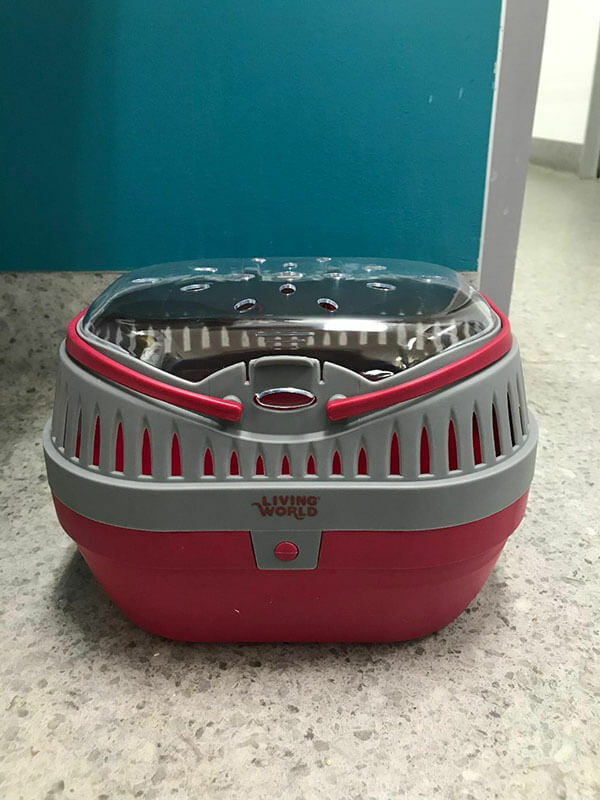 A wire cage, or carrier with a viewing door is also handy as it allows the vet to look at your bird before they handle them to see their posture, breathing etc. Ensure that the door/s close tightly and if it is a cage with sliding doors then place pegs on these to stop them from sliding open (or being opened by clever birdies!). Line the bottom of the cage or carrier with some clean newspaper before coming in to the vet, as this will allow the vet to see your bird’s droppings and easily take a sample to check under the microscope. One secure perch is fine, but if your bird is very unwell or weak it is better to remove all items from the cage/carrier so they can’t fall or injure themselves on the car ride. Too many perches or toys can make removing your bird from the cage/carrier very difficult, so keep this in mind. A small bowl of food (or a millet spray) and a small bowl of water is a good idea if the trip to BBEVS is a long one! If your bird appears stressed during the car ride, covering them with a towel can help. 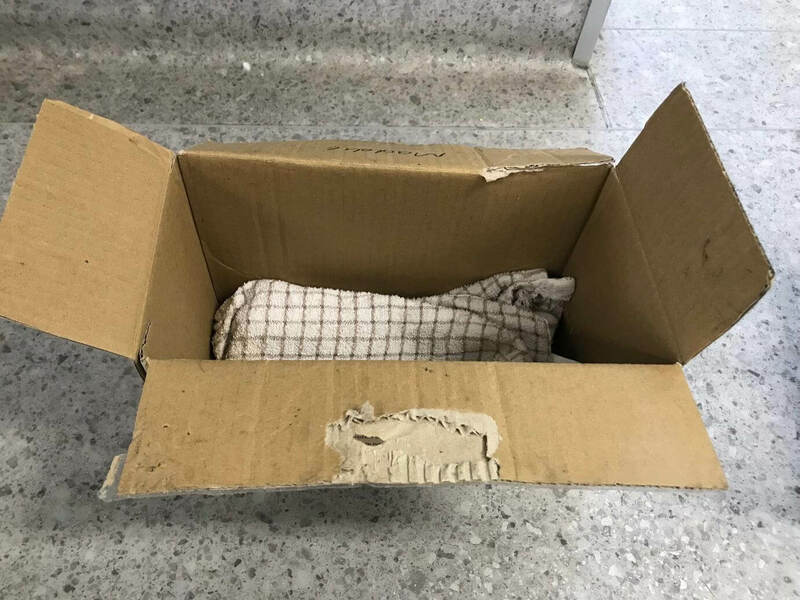 If you have to make an emergency trip to the veterinary clinic and don’t have a cage or carrier then a cardboard box is fine. Line it with newspaper or a towel, make a few small air holes and seal the lid closed with sticky tape. For poultry and waterfowl emergencies a large cardboard box or two laundry baskets (one on top as a lid) tied together can work well. If you’re a very clever bird owner then you may have already trained your bird to wear a harness and lead. If your bird is used to going out and about on a harness then bringing them on their harness is also an acceptable option. Bear in mind that we need a sample of their droppings though, so bring one with you or save the one from the car or shoulder in a tissue! We never recommend just placing a harness on your bird, harness training takes time and dedication. If you have any further questions about safe transportation of birds to the veterinary clinic, give us a call on 07 3217 3533. In a complete rush, a cardboard box with a tea towel can be just fine! This beautiful purpose built carrier has two sections which allows the transport of multiple birds. You can also see that this male eclectus parrot is wearing a harness. Spunky Boris is one our regulars here at BBEVS, he comes in this small wire bird cage and is quite comfortable in it. This kind of carrier is widely sold at pet shops and vet clinics, it’s sometimes marketed as a cat carrier but works great for large birds too! 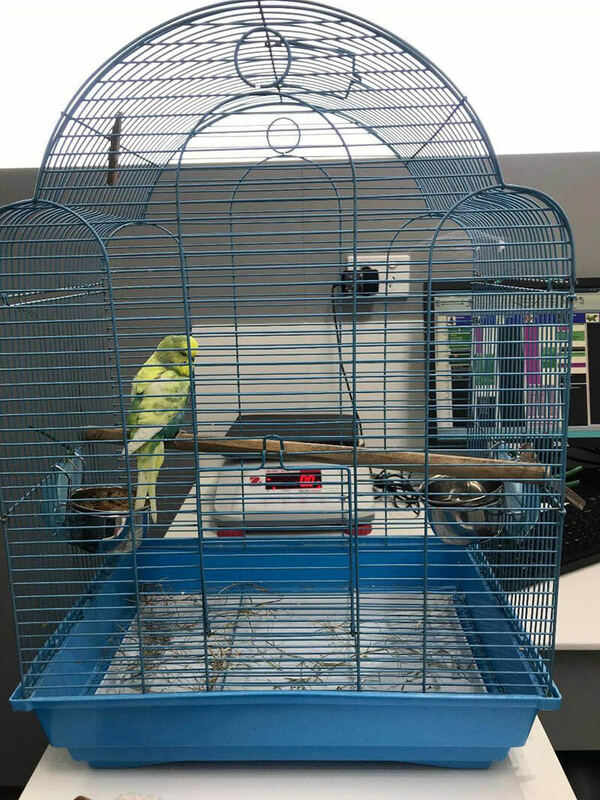 These carriers are often marketed for small mammals (such as guinea pigs and rats) but are great for small birds such as budgies, cockatiels and conures.